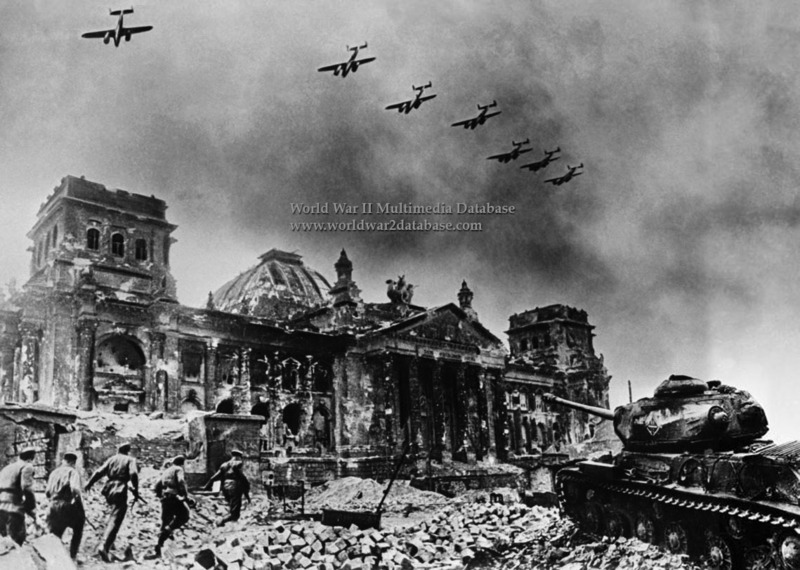 In this composite image by Yevgeny A. Khaldei (March 23, 1917 - October 6, 1997), the renowned photographer has seven Petlyakov Pe-2 dive bombers overflying the Reichstag while Red Army soldiers rush the building supported by a Josef Stalin IS-2 tank. There are at least four separate images in this composite. The Reichstag is one; the original has a destroyed bus in the lower left, which was covered by the onrushing Red Army squad. The squad is likely a staged reenactment, possibly taken on May 4 when photographer Ivan M. Shagin (1904-1982) also photographed the reenactment. The Petlyakov Pe-2 aircraft appear to be the same aircraft duplicated seven times. The IS-2 tank is significant, not only because it is named after Stalin; IS-2 tanks, attached as one heavy tank brigade to each of the Soviet Fronts (Army Group). Later enough IS-2s were produced so that each tank corps had an IS-2 regiment with twenty-one tanks. The IS-2 was reserved for storming fortifications, in concert with combat engineers. It could engage German Tiger I and II tanks, although the Tiger's 88mm (3.46 inch) gun could outrange the IS-2's 122mm (4.8 inch) gun. The composite photo was often used by Soviet photographers, who did not have any ethical issues with manipulating images. Khaldei himself made several other composite images during the war.